UNS COMPANYS DE LA CLASSE VAN ANAR A LA MUNTANYA AMB LA SEVA FAMÍLIA I ENS VAN PORTAR UNS BOLETS. DESPRÉS DE VEURE'LS A CLASSE, VAM PUJAR AL LABORATORI I ELS VAM OBSERVAR DETALLADAMENT PEL MICROSCOPI. MIREU QUINA EXCURSIÓ MÉS DIVERTIDA VAM FER! VAM PASSEJAR PEL BOSC I VAM TROBAR MOLTES COSES DE LA TARDOR... FINS I TOT LA CASA DE LA CASTANYERA! QUÉ BONIC ÉS EL BOSC A LA TARDOR! LES OQUES I ELS CONILLS JA HEM COMENÇAT L'ESCOLA I AQUEST CURS JA FEM P4! JA HEM DEIXAT DE SER MARIETES I CARGOLS I ANEM A UNA NOVA CLASSE. ELS CONILLS TENIM UNA NOVA MESTRA, LA MÍRIAM. I LES OQUES SEGUIM TENINT DE MESTRA A LA MAITE. HEM PENJAT UNES FOTOS PER QUÈ POGUEU VEURE EL QUE HEM FET ELS PRIMERS DIES A LA NOVA CLASSE! ESTEM MOLT CONTENTS D'HAVER-NOS FET UNA MICA MÉS GRANS! HEM ANAT AL MERCAT DE POMAR. 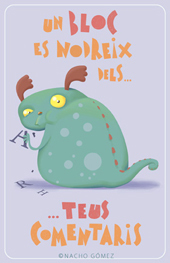 HEM VIST TOTES LES PARADES I ELS ALIMENTS QUE VENEN: PEIX, CARN, VERDURES, FRUITES, OLIVES, PA I PASTES. HEM APROFITAT A COMPRAR FRUITA DE TEMPORADA: MADUIXES, CIRERES, CINDRIA I MELÓ. DESPRÉS DE PAGAR LA FRUITA HEM ANAT A L'ESCOLA PER GUARDAR-LA I DEIXAR-LA APUNT PER FER UN TASTET. DIJOUS VAM ANAR A PSICO I VAM REPRESENTAR ENTRE TOTS LA LLEGENDA DE SANT JORDI. PRIMER LES NOSTRES MESTRES, L'ALBA I LA MAITE, ENS VAN EXPLICAR LA LLEGENDA I DESPRÉS VAM COMENÇAR A PREPARAR LA REPRESENTACIÓ. VAM REPARTIR ELS PERSONATGES I VAM RECORDAR EL NOSTRE PAPER, EL QUÈ HAVÍEM DE FER CADASCÚN DE NOSALTRES, ENS VAN MAQUILLAR I... A ESCENA!